Based on knowledge from traditional Arab medicine, this in vitro study aims to evaluate cytotoxic and cytostatic effects of traditionally used as anti-cancer propolis from four different regions in Morocco. Propolis samples were collected from different locations in Morocco, which are characterized by different plant predominant vegetations. The resin, wax and balsam of hydroalcoholic extract of propolis content were identified, and the antioxidant content was analyzed with the use of HPLC and colorimetric methods. The antioxidant activity was assessed by DPPH, ABTS and ferric reducing power assays. Cells from the human colon carcinoma cell line (HCT 116) were treated for 24h (cytotoxic effects) and 72h (cytostatic effects) with increasing concentrations (0-1000 µg/ml) of methanol extracts from the four propolis (N1, N2, NC, PJ). Results obtained using the MTT assay indicate that N1, NC and PJ showed no significant difference between their cytotoxic and cytostatic effects with IC50 of 300, 750 and 700 µg/ml, respectively. A clear and highly significant cytostatic effects were measured with N2-extract with IC50 of 750 µg/ml. Furthermore, propolis with high resin and low wax content had high level of antioxidant compounds, and strong antioxidant and anticancer activities. These results indicate that the traditionally known anti-cancer effects of N2-extract might be mediated in part through cytostatic effects. ISNAD TOUZANI, Soumaya , KADAN, Sleman , KMAIL, Abdalsalam , SAAD, Bashar , LYOUSSI, Badiaa . "In vitro Assessments of Cytotoxic and Cytostatic Effects of Propolis in Cells from the Human Colon Carcinoma Cell Line (HCT 116)". 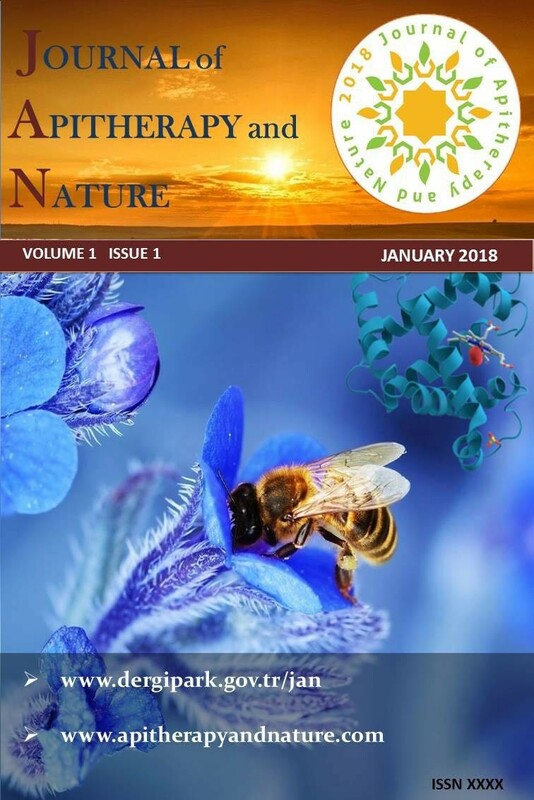 Journal of Apitherapy and Nature 1 / 3 (December 2018): 51-51.